So often we hear people say, "Our immigration system is broken." But what exactly does that mean? In this State of Opportunity special, we hear answers to that question from various angles. The United States immigration system is a complex and confusing web of policies. For years, lawmakers from both sides of the aisle have called out for an overhaul of our immigration system, but no one can agree on what those changes should look like. "The assumptions that people have – for example if you marry a U.S. citizen or have a U.S. citizen child – there will be a path for you to legalize your status, and that's just not the case." For the 11 million undocumented immigrants living in this country right now, the outcome of this sharp political debate has deeply personal consequences. Susan Reed is a managing attorney at the Michigan Immigrant Rights Center in Kalamazoo. She sees this play out every day in the lives of undocumented immigrants and their families. Javier Solorzano was 13 when his mother was sent back to Mexico. Shortly after that, his two brothers were also deported. Solorzano was left without any family in the U.S. He moved in with his best friend until he graduated high school in Monroe, and then went off to college. We asked Solorzano to reflect on the challenges of being separated from his family and how it has shaped the person he is today. "We are not here to freeload off of the United States. We are simply here to live, have the American dream." In January of 2016, a house fire killed five young men in the basement of a Novi home owned by Roger Tam and Ada Lei. They were later found to be undocumented workers from Mexico who were living there while employed at the couple's Chinese restaurant, Kim's Garden. Michigan Radio's Sarah Cwiek reports on the tragedy which provided a rare look into the hidden world of undocumented immigrant labor. It's a stark reminder that you're likely meeting undocumented workers constantly as you live your daily life. "They're in every fabric of our society. You can't really go a single day without encountering one of them. Although you wouldn't know it, because they're living under the radar." Teresa Hendricks with Migrant Legal Aid talked with us about undocumented workers who live under the radar, yet are so entwined in the fabric of our everyday lives. They're working and living alongside us, fearing the traffic stop or tip-off that could tear their families apart. And there is so much these undocumented workers want to say to us, if they had the chance. Blanca grew up in poor Argentina and came to the U.S. in search of work when she was 17. Now 30, she's a mother of four children and lives in West Michigan. Much of our national debate about immigration reform focuses on unskilled foreign-born workers. But there's another side to the story. Many highly skilled foreign workers have the technical knowledge that businesses in Michigan badly need. "So it's not that you're coming and taking away the jobs. You are trying to fill a gap that exists, that nobody's able to fill." Tel Ganesan is the CEO and president of Kyyba, Incorporated. He told us that America's immigration system should be determined by the needs of the economy, not political goals. And Nehal is a recent graduate of the University of Michigan, Dearborn. He studied Automotive Systems Engineering and has seven days left to get a job. If he doesn't succeed, he'll have to return to India. He explained some barriers international workers face to employment. 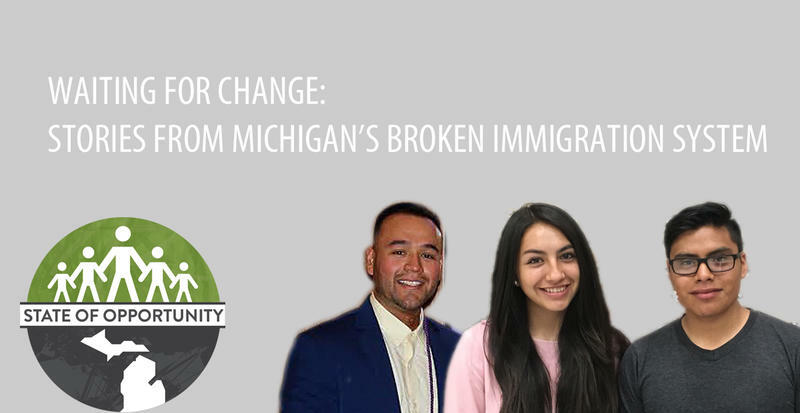 Daniel Lopez and Sendy Lopez are two, unrelated, young immigrants in Michigan caught up in an immigration stalemate. They're both from Guatemala, and came to the U.S. when they were seven and nine respectively. Thanks to Deferred Action for Childhood Arrivals, or DACA, Daniel is among some 700,000 young people who are protected from being deported. Sendy, however, does not have legal status.